It can never be too hot for gooey cheese, grilled eggplant, and tomatoes. This easy vegetarian recipe uses a handful of ingredients, takes minutes to make, and delivers big on flavor. 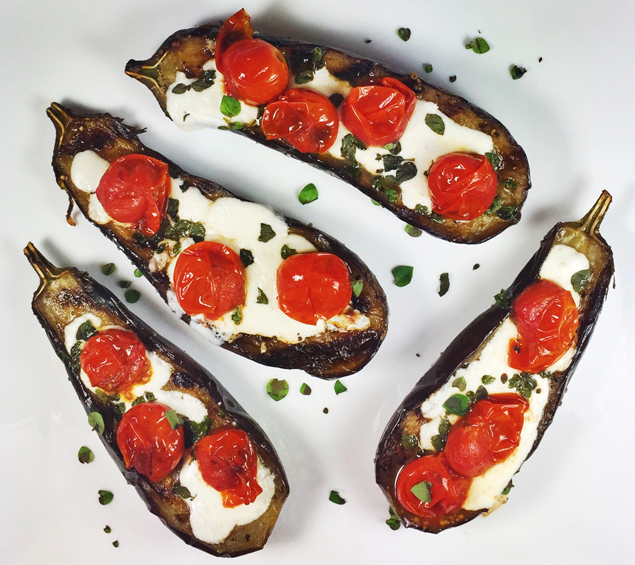 Grilled baby eggplant halves are topped with fresh mozzarella, grilled cherry tomatoes, and fresh oregano. Serve as a side dish or make it a meatless meal. Heat a grill or grill pan to hot. Brush the eggplant on both sides with 2 tablespoons olive oil. Sprinkle the cut sides with 1 teaspoon salt, ½ teaspoon of pepper, and ½ teaspoon of powdered garlic. Set aside. Toss the cherry tomatoes in 2 teaspoons of olive oil and a big pinch of salt. Divide the tomatoes evenly on 6 skewers. Lightly oil the grates of the grill or grill pan with a paper towel soaked in olive oil. Place the eggplant, cut side down, and cherry tomatoes on the grill in a hot spot. Grill the cherry tomatoes, frequently turning, until they are marked and just starting to wilt about 2-4 minutes. Remove and set aside. Turn the eggplant over after the cut side is browned and lightly charred. Move the eggplant to a cooler area on the grill, sprinkle with salt, and cover the eggplant with the grill cover or foil, and continue cooking until a small knife can easily pass through the eggplant, about 5-8 minutes more.